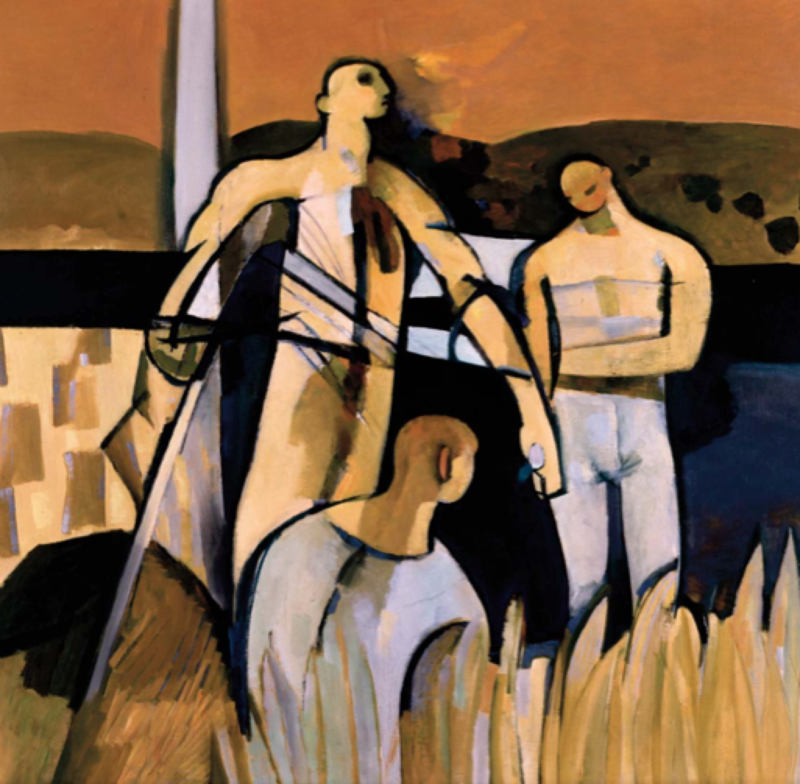 Third Assembly of Figures (Harvest Assembly) is unusual in that it is the only one of Vaughan’s ‘Assembly’ painting that identifies the figures and makes clear their occupation. The three dignified, corn-coloured men simultaneously embody heroic nobility and delicate poignancy. The physically taxing occupation of the reaper is, by its very nature, unavoidably melancholic, tied in with the cycle of the seasons. The bowed head and melancholic demeanour of the figure at the right indicates that this is also a memento mori painting, concerned with the passing of time and the brevity of human existence. Such harvest scenes have a long tradition in British painting and Vaughan believed that landscape, as a pictorial subject, could only be considered by its remoteness from or proximity to human activity; he was therefore particularly attracted to farmlands and fields that retained evidence of human intervention. This preoccupation with things idyllic and pastoral can, of course, be traced back to William Blake and Samuel Palmer. From them Vaughan derived the idea that good land management and careful husbandry communicates something health-giving and moral to the viewer. Similar qualities also underlie his late Essex paintings. The central figure, radiating vitality and raw physical energy, breaks off from his labour and pauses to look outwards over the landscape. At the right in the foreground, golden corn has yet to be gathered, while at the left in the background, we see bales of hay in the pale, yellow field. The year before he painted this canvas, Vaughan revisited Yorkshire for the first time since the war and the swelling distant hills here, recall those moorlands.